Pagans defeating anger and depression. People say that Life is strange, an enigma, but with just a little bit of curiosity and effort, we may arrive at the doors of understanding and acceptance of who we are and how we can transmute our weaknesses into our strengths. What exactly is anger? And is anger necessarily a bad thing? In our society of opinions and entitlement to opinions, experiencing anger is quite common, if not natural. The truth is that sometime or other in our life, we are going to argue with someone, disagree, get unfairly accused, exchange heated words and consequently get upset or angry. So, when it comes to anger, it is not a matter of “if you’ll get angry…”, it is a matter of “when you will get angry”. So if it is pretty normal, why is it so feared and criticized? Anger is a legitimate emotion; an alarm bell, which informs us that something is wrong in our innermost spheres of being, in our most intimate part of ourselves (there where our spark of divinity dwells) and or with those around us. We experience anger when someone is taking advantage of us, or says something unkind or unsavoury to provoke our “godly ire”. So what should we do, when these situations of conflict arise? We should be committed to restoring peace and harmony, as well as internal equilibrium, with a level head, not in a confrontational manner, but avoiding everything that may trigger off the escalation of anger. So let us analyze the matter a little closer. Anger is a valid emotion as it lets us know that something is wrong inside ourselves or between ourselves and others. Rage, on the other hand, is the term used to define the actions that stem from anger. This means therefore that anger is an emotion and rage is the physical acting out of the anger which we are experiencing. Many of us have grown up in homes where verbal abuse, abusive behaviour and anger were the order of the day. We are so conditioned to regard flying off the handle as the norm that we actually fail to see how these insidious social cankers permeate our lives and control our reactions and behaviour. We do not see that indulging in verbal abuse escalates the anger. How the anger, which wells up inside of us finally spills over into the life we live inside our homes, destroying it and worst even, destroying our families, affecting our and our children’s psyches. We get upset, for the smallest of things, assuming the worst possible interpretation of what is being said. We do not communicate, question and clarify. Instead we resort to name-calling, and suddenly the situation becomes a hurtful one, in which the person we are arguing with, is discredited. Name-calling is therefore a tactic used by the antagonist, to make the other person feel “less than” and to force them into submissive behaviour. Judging and unedifying criticism are also forms of verbal abuse that are resorted to when anger takes over our ability to reason and think in an empathetic manner. It leads to withdrawal. Ordering and threatening are further used to create a climate of fear and submission, momentary compliance and often leads to physical violence. Accusations and blaming are the inability to take responsibility for our shortcomings and errors. This provokes resentment and eventually rebellion. Joking and laughing matters off, and discounting another’s issues, trivializes a potentially serious situation and creates an atmosphere of derision and belittleling. It is a form of disrespect and leads to heated altercations and the flaring up of tempers on both sides. This in turn will either lead to violence or the eventual withholding of attention, affection, pertinent information, undermining a person by going behind their backs, making promises you don’t intend to keep, etc. The abuse of trust is yet another form of abusive behaviour. Denial and “selective forgetting” of such incidents, will not make the problem go away. Slowly, relationships and affection are eroded away. Remember, anger, left unattended, can often lead to family tragedies, dismissal from the work place, public brawls and even arrest. Let us remember that acting out in anger is resorting to the wrong form of communication, learnt whilst growing up. It is about power and control over others, because the angry persons lack personal control over their own lives, their emotions and thinking processes. People who are abusive are so because they lack in self-esteem, self-confidence and self-control. Furthermore they lack the knowledge of themselves and how their feelings, as well as their emotions and body chemistry, operate and do not know how to deal with them adequately. Anger combined with substance abuse causes tragedies on our roads every single day, tears apart homes, causes fights, poverty and unemployment and can eventually lead to imprisonment. With these results, come more anger, come shame and the lack of self-worth, increases and spills over in more angry words that affect our kith and kin. The quality of our lives is directly measured up against the quality of the relationships in our lives. It is in direct proportion to it and, in turn, it is related to how we manage pressure, stress, problems, disagreements, confrontation, etc. What is needed, is the admission of being caught up in this negative programming and consenting to and committing oneself to learning more effective and less harmful ways of communicating. Long before Athens became the ruling capital of Greece, on the isle of Crete, lived a King called Minos. Minos who angered Poseidon (the Earth-Shaker) by not offering in sacrifice the great white bull that had been destined for that purpose. Indignant, Poseidon made Pasiphae [Minos’ wife] fall in love with the bull. Pasiphae disguised herself as a cow (inside a statue) and the bull copulated with her. The result of this union was a hideous and fierce-looking creature, half man, half beast, which was hid inside an enormous labyrinth built by the master architect, Daedalus, at the Knossos. The creature bore the name, Minotaur, or be it, Mino’s Bull. The great but defeated Greek King Aegeus of Athens, was forced, every year, to pay tribute to King Minos of the Minoans, who lived upon his kingdom on the Isle of Crete. Every nine years the defeated King of Athens would send seven young men and seven young women, in a sailing boat with black sails, en route to Crete, to pay his tribute to the Minoan King. Upon arrival, the young men and women would be dressed in the finest robes and be fed the most sumptuous meals, before being left to their own devices in the labyrinth’s corridors. Inside the maze, Minos kept his wife’s son, the hideous monster, or Minotaur. The fourteen youths would be abandoned in the labyrinth and wonder lost until, one by one, they would be cornered and eaten by the Minotaur. It is said that nobody ever exited the labyrinth. Nobody ever returned. One particular year, King Aegeus’ son, Theseus, begged his father to send him on that boat. 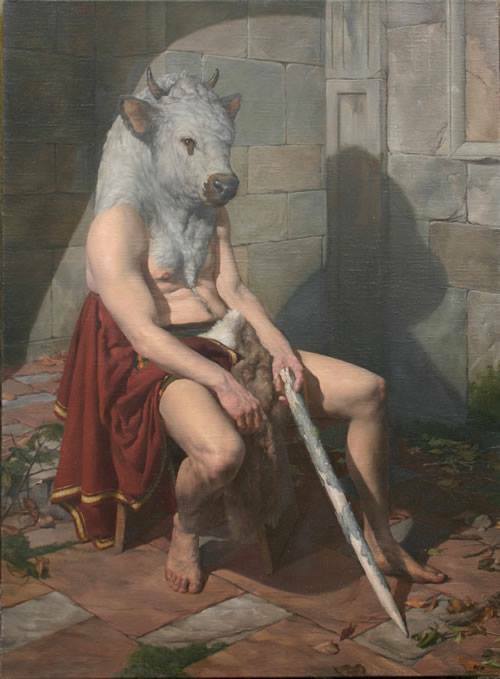 He had heard about the Minotaur and wished with all his heart to slay it. King Aegeus was reluctant to send his only son, but on his insistence, Aegeus let Theseus depart for the Knossos. At the banquet before the sacrifice the handsome and courageous youth sat next to Minos and his daughter Ariadne, and the two young people fell hopelessly in love. Theseus proposed that if he defeated the Minotaur, he could take Ariadne back to Athens. Believing that this was not possible, King Minos consented. The lovestricken Ariadne desired Theseus to be successful in his endeavour, so she presented him with a ball of thread, which Theseus attached to the door, as she had bade him do, unwinding the thread as he progressed into the belly of the earth and leaving the way back and out, carefully marked. Brandishing his sword Theseus walked into the underground cavern and maze, and courageously made his way towards the sleeping Minotaur. Sensing that someone was coming, the Minotaur awoke and awaited the meal that bravely and stealthily wove its way towards him. First scuffling and then battling with valour, the two royal sons, caused such clamour and turmoil in the bowels of the ancient Earth, that the court of King Minos above, held their breath in anticipation and fear for the fate of the Athenean prince. Theseus managed to kill the Minotaur. He slew the monstrous creature and then used the trail of twine he'd lain down at the entrance of the labyrinth, to find his way out of the maze. Upon his exit, the young couple embraced, and true to his word, King Minos allowed them to leave for Athens. Whilst Theseus and Ariadne sailed back to Athens, Theseus saw Dionysus in a dream. In this dream the Chthonic God requested that Theseus do not marry Ariadne, but rather, leave her on the isle of Naxos, where His cult was practiced. Dionysus told Theseus, that He wanted her as His bride and would find her and take her with Him he told Theseus. Well, the devoted Theseus did as he was bid. He left Ariadne as she slept on the beach. Instantly, the isle became so gloomy and so filled with sorrow, reflecting the abandoned Adriane’s heartache. Theseus was so mortified by her hurt that he forgot to remove the black sails before resuming his voyage back to Athens. King Aegeus, watched the sea for days, anxious to find out the outcome of his son’s encounter with the terrible Minotaur and on seeing the returning ship with the black sails unfurled in the wind, Aegeus believed his son had died in the labyrinth at Knossos. Filled with grief, he cast himself into the sea, where he allowed himself to be overwhelmed by the current and waves and died by drowning. That very sea, the Aegean sea, was named after the grieving Greek King, who commended his sorrow to its depths. Upon his return Theseus became King and an Athenian hero. We, like King Minos (our conscience), have angered Poseidon (the divine self) by not sacrificing our animal nature (the white bull) to our Inner Higher Power. Pasiphae (emotional persona) has taken the seed of the bull (the programmed negative and destructive feelings in us), and has given birth to a fierce half-man-half-beast creature, the Minotaur. This Beast hides within the labyrinth of our mind, continuously making itself heard through the roaring bellows of our raging heart, every time we get angry and lose ourselves to hubris, ego and ire. Like Aegeus (which represents our vulnerability/helplessness), we have sailed young men and women (our ideals) across the oceans of our troubled emotions, to unknown lands and unknown outcomes. We have dressed them in the finest of robes and fed them with the delights of the earth and sea, as well as accompanied our ideals to the doors of the labyrinth, where we have sacrificed their happiness and innocence to the beast that lives in the maze within us. Like Theseus (courage and devotion), we need to make avail of Ariadne’s ingenuity, the connecting thread (the golden thread of Divine Consciousness) that will lead us out of danger, matter and spirit, working towards our spiritual advancement and final liberation from the visceral windings of material ego and its entrapments. Our loss of control trigger off Poseidon’s unpredictable and violent tremors, which send us into panic and destructive mode, followed by temperamental outbursts, dictated by our lack of emotional quotient and the skills to manage these intense emotions. Yes, the labyrinth is the intimidating reality within us. Like Theseus we need to volunteer ourselves as the sacrifice. Like him we need to decide to volunteer as one of the sacrificial victims, so that we can annihilate the Minotaur within. Next week we will discuss the Mechanisms of Anger. Thank you and may your week be one of perfectly sweet communication and happy interactions.